Editorials from Theslowlane: Service station gone, but old reader board remains. Says, "ride your bike." Service station gone, but old reader board remains. Says, "ride your bike." I am not sure why they tore down this old filling station near my home. Besides the reader board, there is little left in this weed tangled lot. Little besides an aeration device. Must be for environmental cleanup. Could said service station be the victim of a leaky tank? Anyway, I like the message. 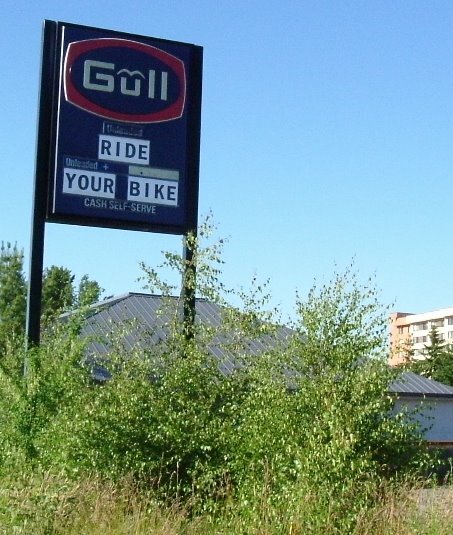 With all the problems of an oil economy, it is time more people rode bikes. Public transit also.